Nagoor babu tried a variety of roles in Film Industry in his initial days from a track singer to character artist in few films. Then he started assisting Telugu Music director Chakravarty and worked closely with Balu-Suseela-Janaki trio who were ruling Telugu musical waves of those days. But Destiny decided something else for him . He met Ilayaraja and he got a new name “Mano” from Ilayaraja. Thus started his successful musical journey as a playback singer for lead roles mainly in Raja sir’s movies. He sang a variety of songs for Ilayaraja and many duets with variety of singers. 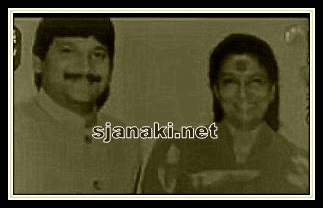 As always Ilayaraja reserved some of best tunes for S Janaki in Mano’s duets. Mano-S Janaki songs were huge hits during period from late 80′s to early 90′s. They sang duets for Devandran,Deva ,Vidhya sagar and others as well but, their songs for Ilayaraja were special ! Mano Janaki Tamil Duet Hits Vol1Click Here..
Mano Janaki Tamil Duet Hits Vol2Click Here..